A bus tour through England visiting every county and all the county towns. The out-of-town motel that I'd been forced to accept for my overnight stay in Durham at least had the advantage of being well-served by bus and my first bus of the day stopped right outside. County Durham extends southwards to the River Tees at Darlington and I could have taken a number 7 straight there, but with plenty of time to spare, due to the paucity of services farther south I could take in a bit more of County Durham on the way. My first bus was therefore an X21 to Bishop Aukland. Despite having come through from Newcastle at the tail end of the morning rush hour it arrived bang on time at 0938. The route was via the town of Spennymoor and then through open, upland countryside. The bus entered Bishop Aukland by a back route avoiding the town centre and I left it at a strangely deserted Market Place, that I'd expected to find the centre of the town. I followed the route of the bus through to the bus station along a sort of inner by-pass road, still seeing nothing of the town centre. The equally-deserted and over-large bus station was flanked by what appeared to be a deserted High Street and, nearby, an almost equally-empty shopping centre: where was everybody? It was only when my next bus, service 5 to Darlington, left town that we ran along Newgate Street, the town's actual "High Street" that I saw the real town centre! The number 5 was the least direct and longest of the various services on to Darlington. I chose it because it went via the "new town" of Newton Aycliffe. Most of these post-war "new towns" are very similar in layout and design and I was reminded of Skelmersdale and Telford. I can't say I'm a fan, but having ridden through the post-industrial landscape of the north-east for a couple of days, with its run-down former pit villages and semi-derelict town centres I think I'd find Newton Aycliffe a reasonable alternative if I had to live in that part of the world. Darlington has been in the news lately as its High Street is due to lose both its flagship shops. Marks & Spencers and Binns (part of House of Fraser) are both due to close as shopping moves both out-of-town and online. I had come away without enough spare socks so I did my bit to keep M&S in town, although I don't think it will be enough! Centrepiece of the town centre is the covered market. Like all such places, it too is struggling, but it did seem to still have a bit of life left in it compared to many markets these days. Yorkshire is by far the largest of the English counties and I knew that I'd only be able to see a tiny portion of it on this trip. Indeed, "Around Yorkshire by Bus" would be the subject for a blog all by itself. Like most counties its borders have been messed around with. Historically it was divided into three "ridings" (north, east and west) with the county town of York separate from all three. 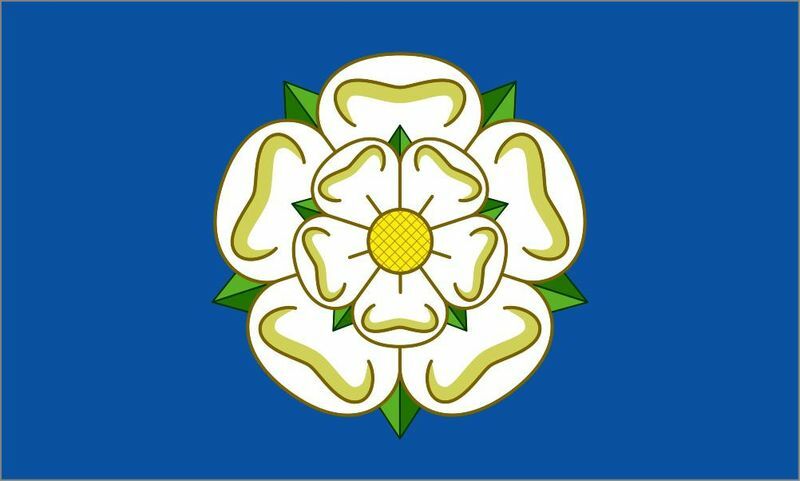 The disastrous 1972 Local Government Act abolished the Ridings and replaced them with two metropolitan counties of West and South Yorkshire and a shire county of North Yorkshire, which included York. The rest of the county was transferred to the newly-invented counties of Cleveland and Humberside and other parts were even given to Lancashire! With the exception of North Yorkshire, all the 1972-Act "counties" have now disappeared, being replaced by a host of smaller local government entities. It beacuse of this sort of thing that I think the 1972 re-organisation is best ignored and why I'm only visiting the One True Yorkshire on this trip. There was a little confusion over the third bus of the day: Dales & District's number 72 to Northallerton. It was ten minutes late arriving at the departure point outside Darlington Town Hall, during which time its stop became blocked by an Arriva bus that had broken down. The arrival of a second Arriva vehicle meant three buses vying for space on two bus stops so the 72 was at the back of the line and the driver made no effort to establish whether all his intending passengers knew it was there before setting off. Perhaps because of this there weren't many passengers aboard to enjoy the ride through pretty, but unspectacular, countryside all the way to Northallerton. It was market day here - quite a large on-street affair with a good variety of stalls and plenty of shoppers taking an interest. I had an hour between buses, long enough for a look round and then an early afternoon tea in a cafe, where the tea was the proper loose-leaf kind and came with a generous slice of home-made cake! Best of all, the bill was rung through on one of those old "typewriter" style cash machines that had been adapted to cope with 21st Century prices. Another Dales & District bus, this time a 153, took me on to my next destination - Thirsk. A fast run mainly on main roads but diverting to serve a few villages that didn't produce any custom until the outskirts of Thirsk itself, which we entered by passing the racecourse. My old mate Hugh met me off the bus and tried to drag me off for a pint, but I have a strict rule of no daytime drinking on trips like this so he had a settle for a walk around the town until it was time for the next bus. In this case the bus hasn't been able to get into the lay-by due to inconsiderately parked cars (bus drivers are used to this). No doubt this arrangement was considered satisfactory in the 1920s, when bus services began in rural areas, and no one has seen the need to change it since, but as with so many things if you suggested it now you'd be met with disbelief and outright refusal! The traffic in York was as bad as you'd expect, but it did make me wonder why anyone thinks it's such a good idea to allow cars right in the centre of such an historic and beautiful city. I wasn't spending much time in York as Hugh had offered me a bed for the night at his home in nearby Knaresborough, so after a quick walk round and a drink and a meal we went to the station for a train. It was, however cancelled! Leaving us with an hour to wait and me with a second compensation claim to submit to Northern Rail to add to the one that has been outstanding since last March!